A tiling made up of squares. The laws of symmetry are unforgiving, but a team of researchers from the US have come up with a pattern-producing technique that seems to cheat them. Suppose you want to create a 2D pattern with lots of symmetry. The easiest thing to do is to take a basic shape, like a square, and repeat it over and over again. This is what happens on most bathroom walls. The pattern you get has a neat translational symmetry: you can pick it up, shift it along by one square horizontally, vertically or diagonally, and when you put it down again the pattern looks exactly the same as when you started. There are situations, however, where what you want isn't translational symmetry, but rotational symmetry: you want your shape to look the same after you've rotated it about some point and through some angle. This is the case, for example, in the production of solar panels. Patterns with a high degree of rotational symmetry are better at capturing sunlight from all angles with the same efficiency. The square pattern has four-fold rotational symmetry: you can rotate it about the corner or centre of any square through 1/4, 1/2 and a 3/4 turn. A pattern made up of equilateral triangles has two-fold, three-fold and six-fold rotational symmetry, and the same goes for a pattern made up of hexagons. The three regular tilings. Can you find the rotational symmetries (ignoring the colours)? But here's the snag: there's a limit to the basic shapes you can use to tile the plane. For example, among regular polygons (shapes whose sides all have the same length and angles between them) only the triangle, square and hexagon will work, any others give you gaps and overlaps. This means there's a limit to the degree of rotational symmetry you can achieve. The most you can get from a periodic pattern, one that has translational symmetry, is six-fold. So for pattern producers there's a conflict between ease of production (using repeating patterns made up of the same shape) and the degree of rotational symmetry they can achieve. The team of US researchers have found a way around this problem using an idea related to the concept of aperiodic tilings: these are tilings made up of a set of basic shapes which don't have any translational symmetry but can exhibit a higher degree of rotational symmetry. 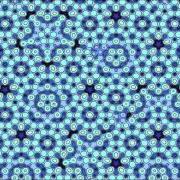 Aperiodic tilings find their echo in the physical world in the shape of quasi-crystals which, unlike ordinary crystals, don't consist of exactly repeating blocks of atoms. The new technique can tile large areas with patterns that exhibit up to 36-fold rotational symmetry, something which not even nature has managed to produce. It exploits a surprisingly simple phenomenon known as the moiré effect: if you take two regular patters, say two square meshes, superimpose them and rotate them against each other, you can create new patterns that are far more complex than the originals. The new technique is called moiré nanolithography (because it produces patterns on the nanoscale) and the researchers hope that it will find useful applications in the production of solar panels and many other optical devices.